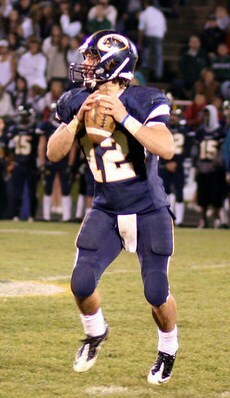 Caleb was named the Associated Press First Team Class B All-State quarterback for the 2010 season. He was also named as the Lansing State Journal Dream Team quarterback and selected as the starting quarterback for the MHSFCA All-Star football game. Caleb’s career stats are very impressive, except his career as a quarterback was his first and only season as a varsity quarterback. Caleb took over the QB reigns from 2009 All-Stater Jimmy Williams with a team that had only three returning offensive starters, including a whole new line and led the Panthers into the State Division III semi-finals. Higbie was a complete package; outstanding arm strength and touch, speed and quickness, ability to scramble and elude tacklers and ability to throw on the run. Other firsts for Caleb, he was Zimmerman’s first left handed quarterback and the first QB that Zimmerman let play defense. Higbie’s final numbers mirrored the team’s offensive balance. He completed 169 of 262 (65%) passes for 2,571 yards and 34 touchdowns, rushed for another 1,253 yards on 155 carries and 11 touchdowns. Defensively, he finished with his career with 84 tackles (52 solo and 32 assists), 2 blocked kicks, 2 interceptions and 7 batted passes. His last minute heroics in wins over Portland, East Lansing, Harper Creek and Mason led LSJ Prep Sports Editor Geoff Kimmerly noted that Caleb may have been the best pure athlete at quarterback that Coach Rob Zimmerman has had at DeWitt. Caleb went on to play football, along with his twin brother, Jacob, to Saginaw Valley State University.